Banana Biker Zombie Juice: Banana Biker is a great mixture of flavours with caramel, banana (obviously) and a hint of tobacco. A great mixture which leaves you just wanting more and more. Banana Biker Zombie Juice 3 x 10 ML is shipped in 3 x10 ml bottles and it contains 80% VG and only 20% VG. It is made in the UK from pharmaceutical grade products. It can only be used in sub-tanks or similar devices. It cannot be used in normal e-cigarettes as the mixture is too viscous. It is available in nicotine strengths which are: 3 mg (0.3%) or 6 mg (0.6%). 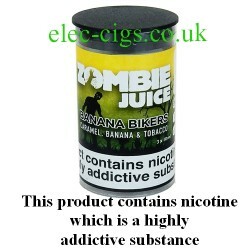 Banana Biker Zombie Juice 3 x 10 ML: This product is not for sale to persons under 18 years of age. 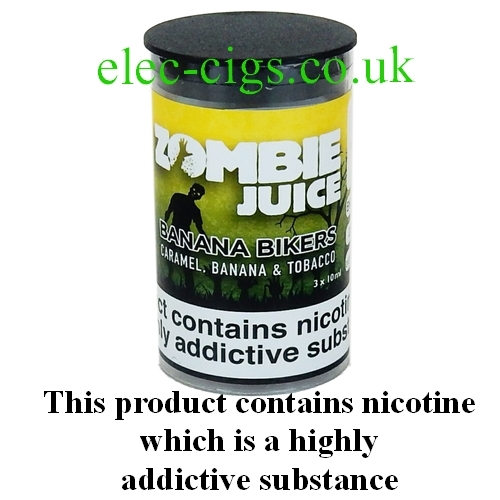 Banana Biker Zombie Juice 3 x 10 ML: This product contains nicotine which is a highly addictive substance.